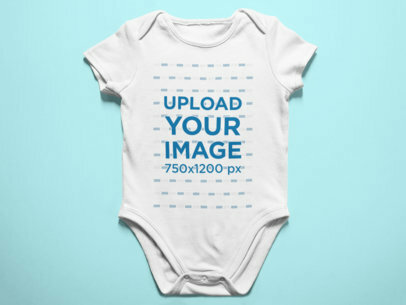 Show everyone that beautiful design for a baby onesie with this colorful mockup from Placeit. This picture has a totally customizable multicolor background that you can change to match your brand's or design colors. Create a cool promotional picture and attract all cool moms out there! 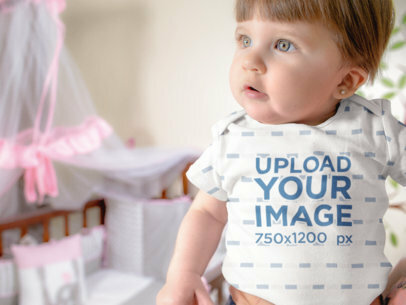 Promote your baby clothing line in a modern way with Placeit's visuals! 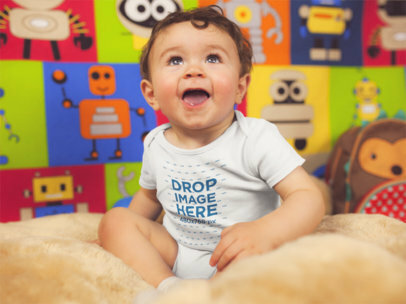 Try customizing your favorite onesie mockup and improve your POD brand in no time. What are you waiting for? Boost your brand today showcasing your designs in a professional way. 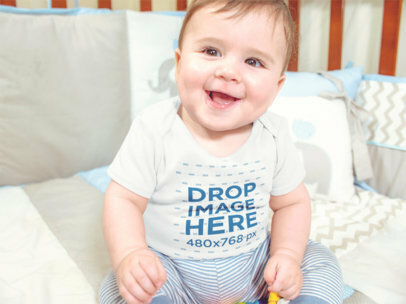 Promote your adorable onesie designs on an actual baby onesie! Your customers will be able to see what your designs will look like on an actual garment. Just customize the settings to your liking and you'll be ready to go in no time. 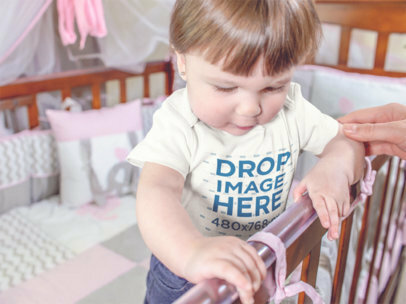 This mockup is perfect for new moms, parents, children's stores, and more! Try it out now! 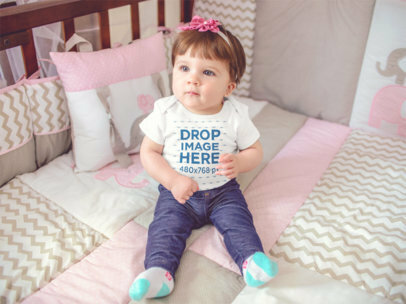 Boost your baby clothing line sales to the roof with Placeit's attractive visuals! 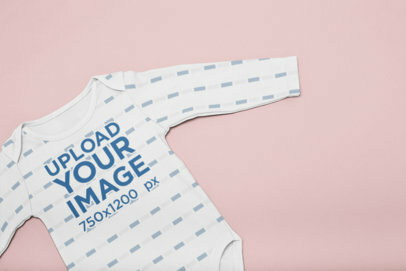 Try this onesie mockup featuring a minimalistic surface, just what you need to showcase your design all over the garment. What are you waiting for? 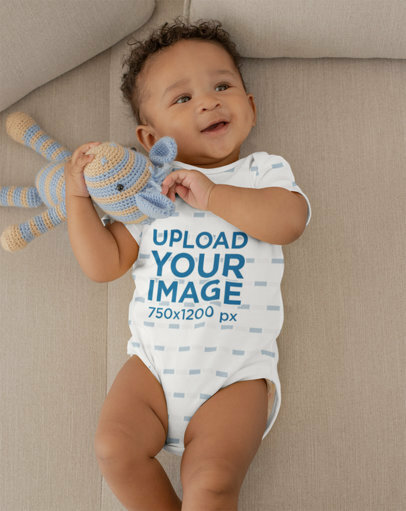 With Placeit's easy-to-use onesies mockups, you can improve the marketing strategy of your brand in no time. 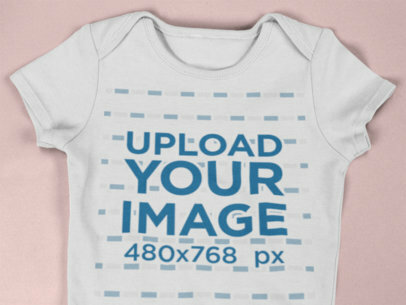 Start promoting your latest baby clothes design with this customizable onesie mockup. You can easily change the colors to your liking and try different clothing designs. Try it out now! 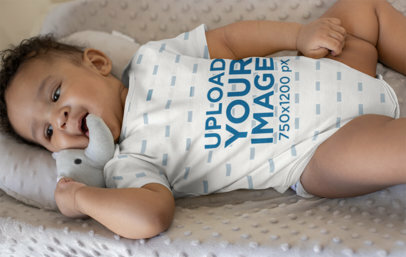 Make breathtaking visuals to promote your baby clothing line with Placeit's photorealistic mockups! 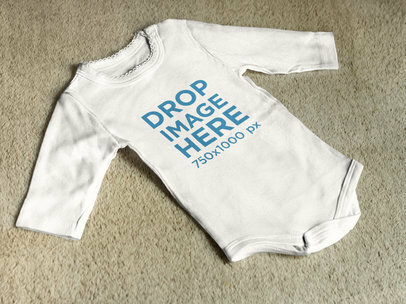 Customize this sublimated onesie displayed over a colorful setting, just what you need to boost your brand and attract new followers online. 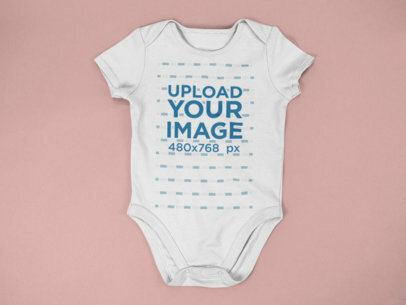 Choose your favorite Placeit onesie mockup and improve your POD websites today! 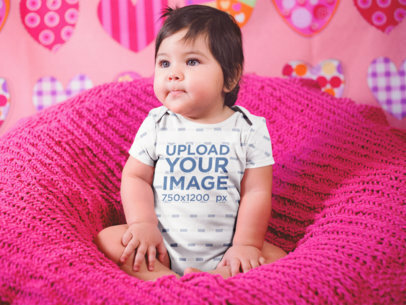 Grow your baby clothing line today with Placeit's distinctive visuals! Just customize your favorite mockup and improve your POD brand right away. 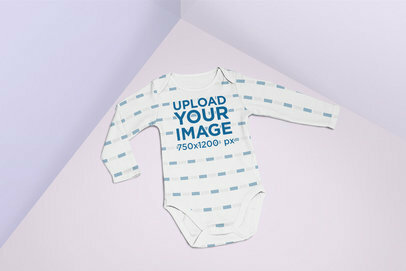 Try this sublimated baby onesie mockup lying in a minimalistic colored background. Amazing, isn't it? Boost your sales with Placeit's professional-looking visuals today. 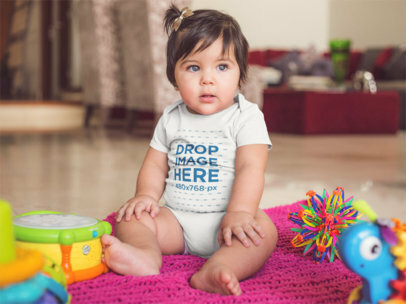 Promote your baby clothing line with professional-looking visuals by Placeit! 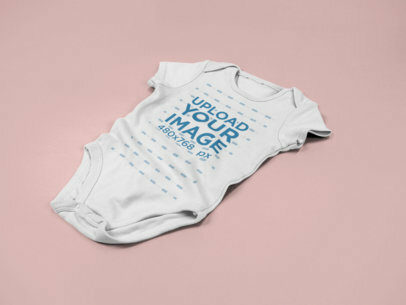 Customize any of Placeit's onesies mockups, like this one lying in a colorful setting, just what you need to boost your brand in a minimalistic and eye-catching way. Try it now! Choose your favorite Placeit smart mockup and improve your POD website today. 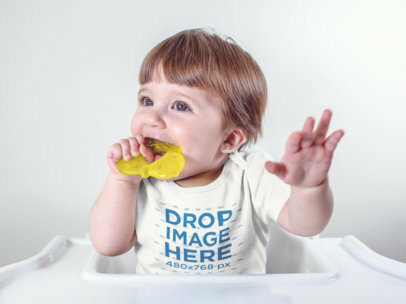 Use now this mockup of a baby onesie lying on a white surface! 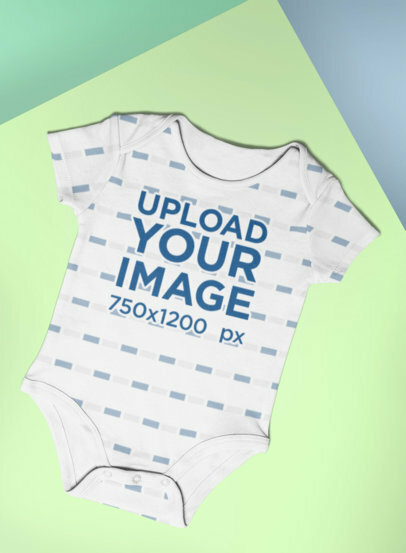 It's an awesome choice for you to showcase your latest baby onesie design, all you need to do to merge your cute design is drag-and-drop your image on the interface! A few seconds is all it'll take for us to process it. Try another Onesie Mockup here! 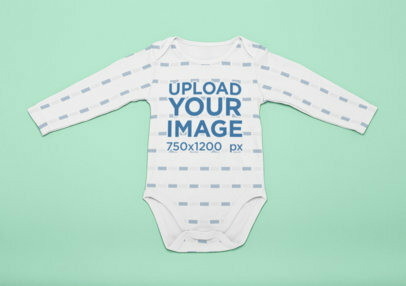 Make your baby clothes brand look amazing with this onesie mockup. 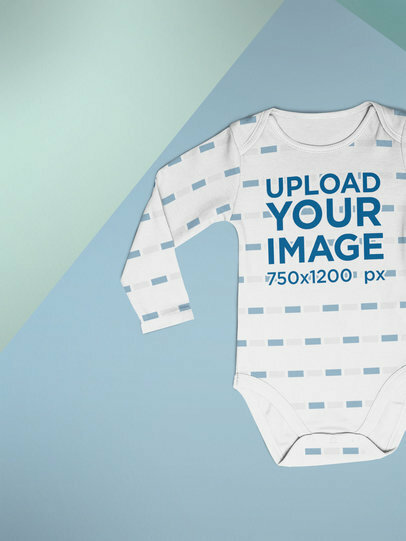 This is ideal to showcase your most creative onesie designs in no time. Just change the color, add the clothing design, and it's ready! 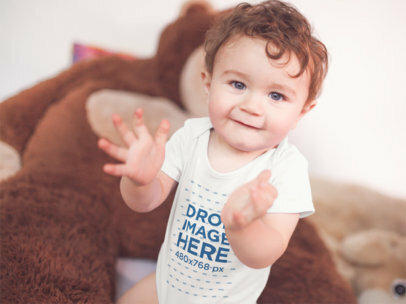 Take a look at this awesome mockup of a onesie lying on a flat surface. 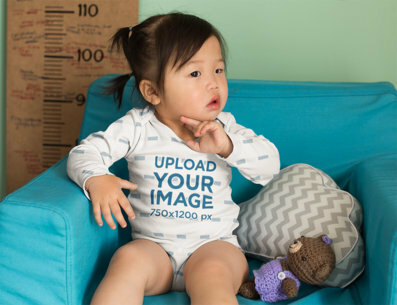 This is the perfect mockup, fully customizable, to showcase toddler clothes designs and any other design from your baby clothes brand. Try it now! For best results, we recommend uploading an image that is 480x768 px. The file must be smaller than 5MB and not exceed 5000 px on either height or width. 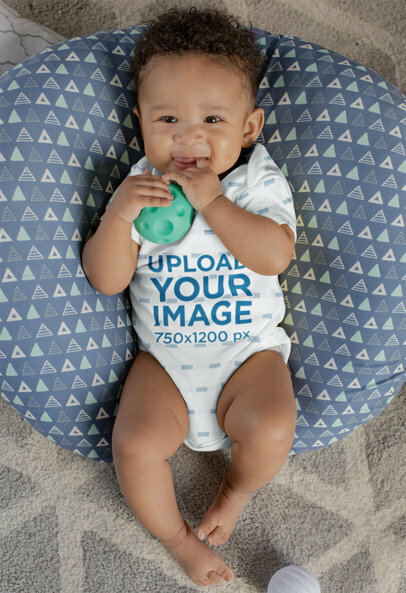 Check out this mockup of a baby girl wearing a onesie while biting her toy and sitting down, it's a great option for you to showcase your latest design! All you need to do is drag-and-drop your image design in the interface, we will process it for you. Try another Onesie Mockup here! For best results, we recommend uploading an image that is 480x768 px. The file must be smaller than 5MB and not exceed 5000 px on either height or width. 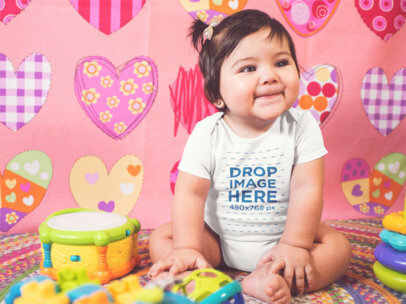 Were you looking for a cute and beautiful way to showcase your latest onesie design? This is it! Just drag-and-drop your image design on the interface, we will merge it for you! 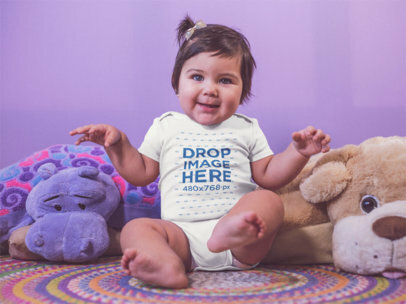 You will be able to use a gorgeous image of this beautiful baby sitting down happy while wearing a onesie and playing with her purple and pink toy! 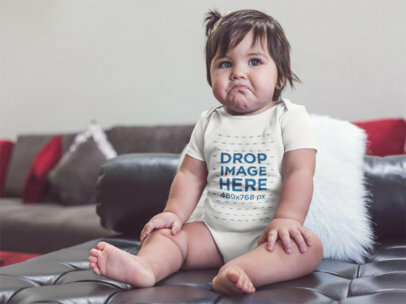 Try another Onesie Mockup here! For best results, we recommend uploading an image that is 480x768 px. The file must be smaller than 5MB and not exceed 5000 px on either height or width. 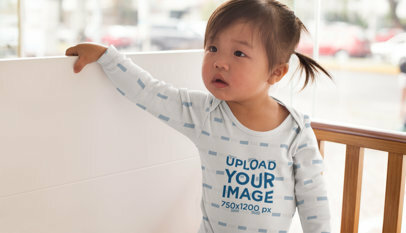 This mockup of a beautiful baby standing on her wooden crib while wearing a onesie is an excellent choice if you want to showcase your cutest onesie design! All you need to do is drag and drop your image file on the interface, we will merge it for you in just seconds! Try another Onesie Mockup here! 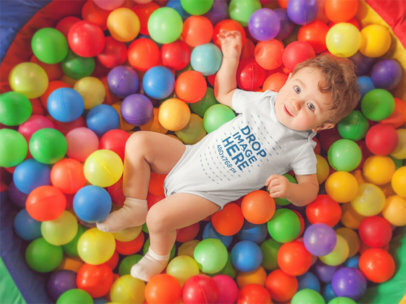 If you have a new kids clothing design you would like to introduce to your specific target market, but haven't got a clue on what the best way for you to do it might be, don't worry because at Placeit we might have just what you need. Use one of our brand new clothing mockups and forget about your problems right away! 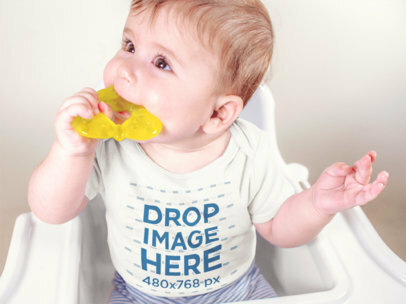 This clothing mockup features a baby's outfit lying on top of a carpet. Make this beautiful template part of your visual marketing campaign today and appeal to your consumers demographic instantly! 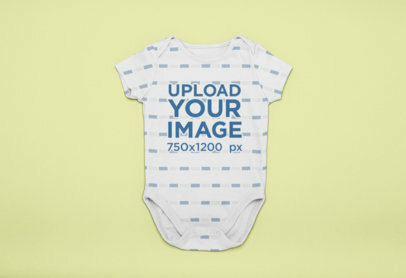 To customize this mockup, all you need to do is drag and drop an image of your design onto the baby's outfit on the template and Placeit will resize it for you. 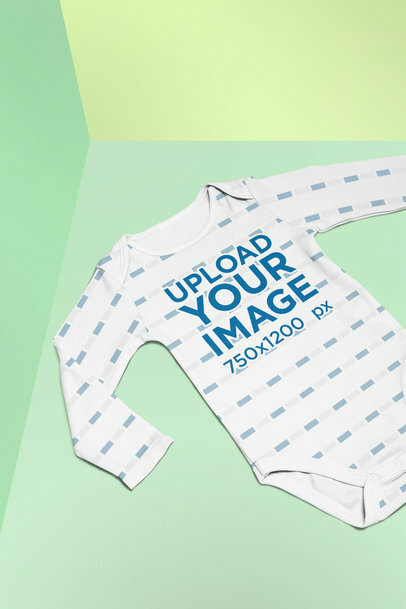 Now thanks to Placeit's clothing mockups you can get original visual content to start displaying your designs to the world within minutes! So what are you waiting for? Waste no more time and make them an essential element of your marketing strategy starting today! To see more Clothing Mockups click here!